The purpose of this project is to provide information needed by project developers as they work with the Environmental Protection Agency (EPA) and state Underground Injection Control Program (UIC) Directors to determine the most appropriate monitoring, reporting, and verification (MRV) approaches and strategies for a CO2 injection site. Two regulations (Environmental Protection Agency, 2010a [Part RR and UU], 2010b [UIC]) require monitoring of greenhouse gases, including those injected into the subsurface, as part of an MRV plan. This project will provide a technical basis to support decision making on how this required monitoring should be accomplished. Relevant guidance documents are in development by the EPA. It is widely believed that a monitoring strategy should be tailored to the sequestration site and the main tool that ensures that CO2 is retained in a zone is extensive site characterization. In recently released rules, the EPA Regional Administrator or his/her delegates are given authority to develop an MRV plan that is optimized for site-specific characteristics. Within the scope of these rules, this study is designed to fill a gap in guidance to determine how to match the site with the possible technologies. Compile a test/teaching set of cases for testing strategies and then train practitioners in applying the strategies to an array of sites. The study is led by Susan Hovorka and JP Nicot at the Gulf Coast Carbon Center (GCCC). It is funded by the EPA and is supplemented by a parallel activities funded by the Carbon Capture Project (CCP). ​Susan Hovorka (left) and JP Nicot (far right corner) along with other members of the Expert Panel at the kick-off meeting in Natchez, MS. The study undertakes to provide technical background information to support regulators and project developers in matching selected monitoring tools and protocols with sites and uncertainties at those sites. Because this arena is rapidly evolving and developing, we have expended significant effort drawing information from diverse sources. Regulators, industries with potential CO2 supply, policy developers, and the public provide input in the areas of concern that should be considered in developing a monitoring program. Tool developers and data reduction specialists provide technical expertise. Monitoring experts with field experience provide information on performance in terms of durability and sensitivity of tools under actual field conditions. GCCC team, members have attended more than 50 workshops, seminars, and public and closed meetings during 2010. We have inventoried global progress on performance of monitoring tools, as well as available information on best approaches. In the first year of the project we contacted experts to provide input into study design and provide field experience with monitoring tools. Collaboration with Carbon Capture Project (CCP) provides additional expert advice especially outside of the US and in the several sub-disciplines of geophysics. We also selected a panel of fifteen experts to serve as advisors to this project. 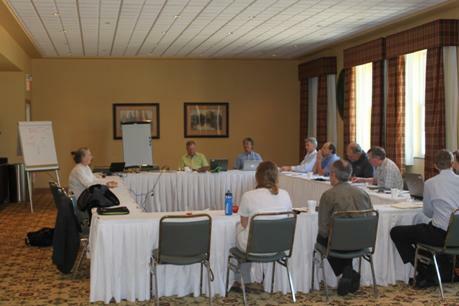 The initial expert panel meeting was held in Natchez, Mississippi on May 5, 2010, in conjunction with the IEA Greenhouse Gas R&D Programme monitoring network meeting. 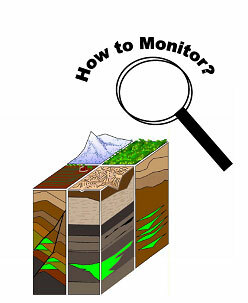 Selection of monitoring tools is a complex process that involves a number of factors, the site-specific characteristics of which influence only a few. The process of testing and monitoring (T&M) and monitoring, reporting, and verification (MRV) are still immature, with both active discussion of policy and regulatory needs and assessment via field tests and tool development. Monitoring in the context of GS has been previously explored and considered, with a number of summaries of approaches, e.g., Nicot and Hovorka (2008), Benson and Cook (2005), GEO-SEQ (2004), DOE NETL Monitoring Best Practices, and WRI Best Practices, among others. Although these documents highlight and rank some of the benefits of various tool types, none of them provides rigorous guidance on the limits of tool sensitivity needed to select a site-specific monitoring procedure. In addition, no consistent view on how to monitor has wide acceptance among technical practitioners, leaving us uncertain as to how to deploy an adequate monitoring program. Considering uncertainty in the variables that will drive monitoring tools selection, we considered three characteristics in selecting the first tools for assessment. Availability of a reasonable body of relevant experience from which the site-specific sensitivity of a tool can be assessed: We considered tools that had been tested in a list of past GS pilots that we considered "monitoring dense" and for which experts are available to consult. Interest in using a tool for monitoring in diverse sites: We considered suites of similar projects that we are working on, and attempted to imagine site types with a range of properties. For example, we imagined structural closures and regionally extensive dipping (with respect to buoyant trapping of free-phase CO2); hydrologically closed and hydrologically open boundary conditions (with respect to brine displacement and pressure build-up, stratigraphically simple, thick, uniform injection zones and highly heterogeneous injection zones); thick and thin injection zones; well-characterized seals and uncertain seals; injection at shallow (>2,000 ft) to deep (>10,000 ft); different surface conditions such as offshore, mountainous, wetland, urban, cropped, thickly forested, and different types of above-injection-zone geology. Next year, models construction will more formally assess this diversity. Tools shown to be useful, sensitive to measuring needed parameters, and durable in the field: We did not select tools thought to be of questionable value. In addition, commercial tools that can be purchased from service companies or vendors were preferentially selected for the first assessments. This choice should not be interpreted to imply that new methods now in development will rise to the front; in fact we hope that this is true. We anticipate that during the course of this project and during the years following project completion, the list of tools selected will grow. However, for this first year and for the methods development proposal to be submitted to the expert panelists early next year, we proscribed the initial tools selected very narrowly so as to assist in methodology development. The following list summarizes our initial tool selection. Additionally, the following tools mentioned by UIC class VI as examples represent future tool development. As these are novel techniques, consideration of these tools is currently deferred. A number of variables determine whether a tool is effective. In this study, we focus on those variables that are site specific. However, to make a clear evaluation, we have prepared a list of factors that influence whether a tool is effective, so that those that are not site specific can be dealt with via specifying best available technologies. Many variables interact to determine whether a tool is effective, adding complexity to our assessment. In this study we force a rather artificial single-variable approach on the assessment. In addition, we have initially selected sets of variables that we think will have a strong effect on tool sensitivity, which is subject to revision as the assessment matures. One major difficulty in determining the appropriateness of tools is determining the appropriate signal threshold that it is desirable to detect. EPA rules provide no threshold below which a leakage or mismatch with model results are considered negligible. The table below provides, for each tool type, a preliminary list of site-specific and non-site-specific variables that impact tool sensitivity. In the next year this matrix will be assessed more deeply via literature review, expert panel review, and where needed in a numerical modeling of tool sensitivity. This version of the table is assembled for the purpose of discussion. Preliminary inventory of site-specific factors that influence tool sensitivity compared with general factors that are the same at all sites. These tracers may be more conservative and therefore more sensitive than CO2 itself. Gage sensitivity, depth error in positioning gage, land surface elevation error. Change in impedance and velocity with change in CO2 saturation.